The past several weeks have seen an increase in the volatility of global stock prices. Even our clients, who are usually very thick-skinned when it comes to stock prices jumping around, have had questions. “What’s going on with the stock market? Should I pull money out now? Should I be worried?” are questions we’ve been asked. Should you worry about the stock market? No. It’s understandable to be concerned. At one point, the Dow had fallen by about 10%. But, while the events of the past several weeks may have been unnerving, stock market volatility is not a concern for us. We’ve seen the stock market behave like this before, especially when short-term stock traders are nervous about something. In this case, they’re nervous about inflation. The increase in hourly wages was the biggest in about a decade. Americans, on average, have bigger paychecks today versus a year ago. That’s good news. But not for skittish stock traders. For them, the BLS report was a sign that inflation may be increasing. After all, companies would have to inflate the prices of their products and services to pay for employees’ higher wages. Corporate profits, which have buoyed the stock market until now, would come under pressure. Why would fears of inflation send the stock market into a tizzy? In April last year, we spoke about the Federal Reserve (“the Fed”) using interest rates to control the pace of growth, much like you would use a gas pedal to control the pace of a car. The lower the Fed pushes the interest rate pedal, the more money flows into the economy and the faster the economy grows. Higher inflation means the Fed will need to ease off the interest rate pedal by increasing interest rates. The problem is, raising interest rates makes it more expensive for businesses to borrow money to finance new projects and their expansion programs. “That makes them less profitable —and their stocks less valuable,” said CNN Money. “Economists aren’t too worried about a sudden inflation shock — prices rose 2.1% over the past 12 months, which is right in the Goldilocks zone,” CNN Money said. “Economists are confident the Fed will keep control of inflation,” noted NPR. Over the last 12 months, the Consumer Price Index rose only 2.2 percent, a rather benign inflation number in our opinion. While it’s impossible to determine the stock market’s movements, the fundamentals supporting the stock market remain sound, in our opinion. Corporate earnings are good. Jobs growth has been decent. The housing market is strong. Others agree. “We do not believe that the very strong global growth and earnings backdrop has suddenly evaporated,” MarketWatch said. A few years ago, investor Warren E. Buffett wrote to shareholders of Berkshire Hathaway and reminded them that stock investing involves risk. “Stock prices will always be far more volatile than cash-equivalent holdings,” Buffett said. Market volatility always garners a lot of media attention, but in reality it has far bigger impact on short-term traders than long-term investors. For short-term traders, market volatility can be the difference between finishing their race in first or last place. For long-term investors, market volatility is more like passing through a rough stretch of road on their drive across the country. What we have seen in the past few weeks is normal activity for the stock market, especially a market that has seen a long run up in value. Some correction is bound to occur, and this is healthy. Some movement from stocks into bonds will take place. 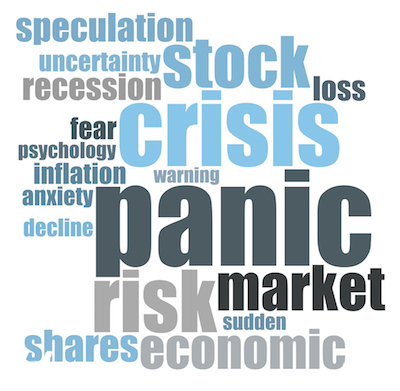 And worry, fear and panic will drive some stock sell-offs from time to time. But is this bad? We say no. “Events over the past few weeks serve as a salutary reminder of both the dangers of crowded positions and of the power of technical forces when combined with consensual positioning,” MarketWatch said. In other words, don’t let what others do affect your investment plan. Stick with your plan. Stay the course. We believe you will be happily rewarded in time. ← What should you do about the Equifax data breach?